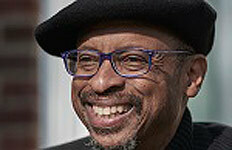 "The Poet and the Poem"
E. Ethelbert Miller is a writer and literary activist. He is the author of several collections of poetry and two memoirs. Miller serves as the board chair of the Institute for Policy Studies (IPS), a progressive think tank located in Washington, D.C. For fourteen years he has been the editor of Poet Lore, the oldest poetry magazine published in the United States. In 1996, Miller delivered the commencement address at Emory and Henry College and was awarded an honorary degree of Doctor of Literature. He has been a Fulbright Senior Specialist Program Fellow to Israel in 2004 and 2012. Miller is often heard on National Public Radio. He is host of the weekly morning radio show On the Margin which airs on WPFW-FM 89.3. Miller is host and producer of The Scholars on UDC-TV, and his E-Notes has been a popular blog since 2004. On April 19, 2015, Miller was inducted into the Washington DC Hall of Fame. The AWP presented Miller with the 2016 George Garrett Award for Outstanding Community Service in Literature. His latest book of poetry, The Collected Poems of E. Ethelbert Miller, edited by Kirsten Porter and published in March 2016 by Aquarius Press, is a comprehensive collection that represents over 40 years of his career as a poet.